Remember the three “R”s? Shara Porter can do you one better: reprint. 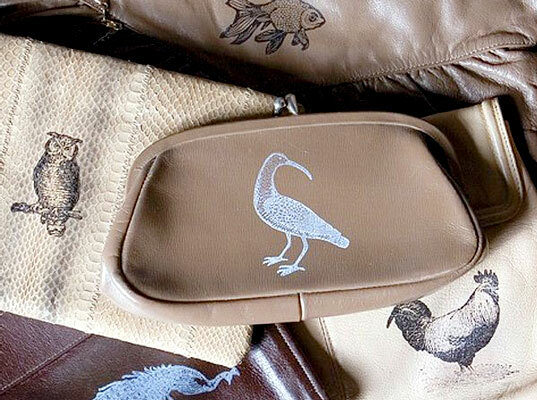 The University of Massachusetts Dartmouth grad, who plies her trade in “hand-printed fine found objects,” retools vintage leather bags and accessories with a quick mend and a hand-stamped illustration. Porter’s world is full of adorable characters and objects placed in the most unexpected ways, resulting in a menagerie of hedgehog wallets, birdcage purses, bumblebee clutches, and “brontosaurus” card holders. “I have always liked finding discarded items and seeing their potential with some sort of alteration,” Porter says. “I love the hunt—and rescuing items that have been passed along.” Her inspiration to juxtapose the idiosyncratic with the mundane, however, came from a sign for a construction company, which not only featured a dump truck but also a tiny, incongruous unicorn in one corner. “I love the hunt—and rescuing items that have been passed along,” Shara Porter says. Although we can argue that vintage pieces should be preserved in their original state for posterity, Porter’s work makes a case for extending an object’s usable life. And, with the bulk of her materials coming from generations past, Porter is s preserving virgin resources for generations to come. Remember the three "R"s? Shara Porter can do you one better: reprint. 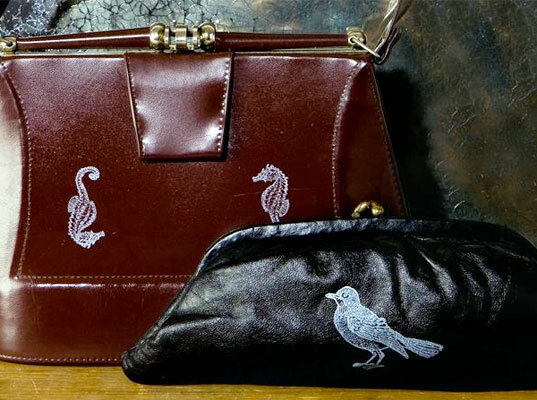 The University of Massachusetts Dartmouth grad, who plies her trade in "hand-printed fine found objects," retools vintage leather bags and accessories with a quick mend and a hand-stamped illustration. Porter's world is full of adorable characters and objects placed in the most unexpected ways, resulting in a menagerie of hedgehog wallets, birdcage purses, bumblebee clutches, and "brontosaurus" card holders.